Sometimes I buy avocadoes that look perfect but when I slice into them I find they are not edible. Avocadoes are not cheap, and I don't like to waste them, so I found another way to use them. Process all the ingredients with a stick blender (chopping blade) or food processor. Refrigerate until ready to use (I use it within 12 hours). To use: smooth over your body and then rinse off. I find this procedure best when using a scrub: turn the shower on for a few moments before you enter it so that the environment is warm and steamy. Turn off the shower, enter the shower, apply the scrub all over your body. Then turn on the shower and rinse off. Optional: add a little almond meal for a scrubbier texture. 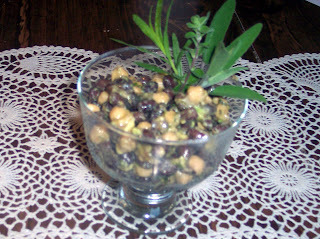 This week, Weekend Herb Blogging is hosted by http://houndstoothgourmet.com/ . 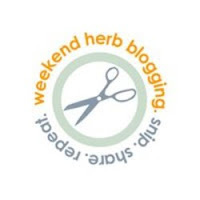 Rules for Weekend Herb Blogging are here. Do you know that homemade Christmas truffles are still yummy in March? They need to be preserved carefully -- I recommend putting them in a ziploc in your mixing bowl and putting a small cookbook, an almost empty bag of flour, and a bag of apples on top of them. Change the bag of apples for a bag of bananas when the apples are gone, then a bag of grapes when the bananas are gone...you get the idea. On St Patrick's Day when you use your mixer to make Irish Brown Bread, you will be pleasantly surprised to find chocolate truffles under your cookbook. You might think about throwing them away when you find them, but do hold on to them for a Friday morning when you almost forget to eat breakfast. This book has been a source of encouragement and comfort to me for the last two months. As I've had to make some decisions for my dad, my role as a daughter has changed; this has been stressful, to say the least. 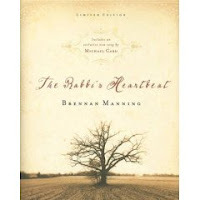 The Rabbi's Heartbeat continually reminded me that God is my Father and I am His beloved child. This familiar truth has been a beam of light on dark days. Brennan Manning has a simple honest style that is welcome during a stressful time. Filled with Biblical truths, it is far from shallow, yet it was very accessible when I was feeling burdened and discouraged. In my searching, I also found these, which aren't as much fun, but are certainly more affordable. 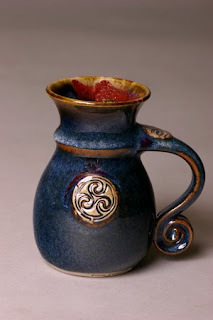 There's a beautiful pitcher here, but I am trying to decrease my cream pitcher collection at the moment. I added these books to my devotional routine during Lent. This was the first year I had celebrated Lent in any way (I also gave up buying books). Both books gave me an introduction to the idea of Lent, and I found them interesting. Both books are written from a Catholic perspective, which is something different from the rest of my home library. Neither of these books will be a yearly tradition for me, but they were helpful for my first Lent season. Small Surrenders quoted more literature than scripture; I enjoyed the quotations but I expected more scripture given the subject matter. Seeking His Mind discussed the life of Jesus. I think someone with a more Catholic background than mine would have enjoyed these books more than I did, but again, they were both useful introductory books. My herb garden is not exactly flourishing, but I was able to pick a few sprigs of this and that for a spring salad. This is a simple recipe that is always popular in our home, with children and guests alike. All measurements are approximate and can be tweaked to your own preferences. Chop herbs and place them with olive oil in a bowl or pitcher. Process with a stick blender (chopping blade) for a few moments. In a large bowl place the beans, green onion, and the avocado. Pour the herbed olive oil over the vegetables. Sprinkle generously with salt and pepper. Mix vigorously. The avocado will mash up a bit, coating the beans. The flavors are best if you prepare and chill the salad for an hour or two before serving. For a more colorful salad, add fresh diced tomatoes. I like to just eat this with a spoon, but it is lovely on a bed of greens, on whole wheat crackers, or on small slices of rustic bread. This week, Weekend Herb Blogging is hosted by Thyme for Cooking. Rules for Weekend Herb Blogging are here. A month or two ago, I read Donald Miller's review of Collected Poems by Stanley Kunitz (at Donald Miller's blog) and consequently checked out the book from the library. I read the first few poems and a few more chosen randomly. I read the last few poems. I tried random pages again. And then I gave up. I found the poems inaccessible, and I decided that not only would I never ever be able to write poetry myself, I was unlikely to even understand it. Last month, Donald Miller recommended Billy Collins' book Sailing Alone Around the Room. My husband read the samples of Collins' work on Donald Miller's site, and enjoyed them so much that he ordered the book. We have both found the book delightful, and we will seek out more of Billy Collins' work. Billy Collins writes poetry on a wide selection of subjects, from the amusing to the thought-provoking to the truly unusual. Each poem is immediately enjoyable, but can be lingered over and savored as well. chances to win. Yay for free stuff! Thanks to Arby at Arby's Archives (see list of blogs at right) for posting this! A Fun Event: It's Wear a Sweater Day! We visited a local park today. I wondered why at least four children were wearing sweaters on a seventy degree day. Perhaps they were celebrating? A Walk with Jane Austen, by Lori Smith, is the story of the author's journey to England where she visited many sites associated with Jane Austen. The book blends her descriptions of Jane's environment with thoughts on Jane's life, as well as Lori's own life. At the beginning of the book, Lori spends a week getting acquainted with a handsome young man at Oxford, and throughout the book she wonders what the future holds for the two of them. I found the book to be an unusual way to learn more details about the life of Jane Austen. I enjoyed the author's comparisons of her own life to Jane's and to Jane's heroines. When she mentioned being a bit of a Marianne one day when she'd rather be an Elinor, I could sympathize. I wouldn't put this book in the can't put it down category, nor would I put it in the deep spiritual insight category (although it did have its thought-provoking moments), but I found it a pleasant companion for an evening bath. It will be a valuable tool someday when we visit England; Austen sites will be on our must-see list. Lori Smith also hosts the blog Jane Austen Quote of the Day, with a quote from an Austen book almost daily, and occasionally a quote about Jane herself. I love to try new lip products, but I always come back to this one. 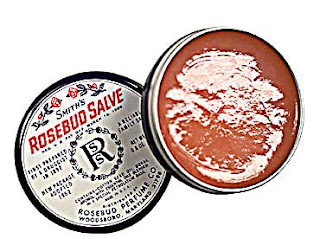 On the scorching days of our desert summers, or the windblown winter days of our holidays in the Northwest, I rely on Rosebud lip salve. This is not a new product; it's been around for more than a hundred years. It feels fabulous, it adds a little shine, and it heals chapped lips. My only complaint is that if I've just applied moisturizer to my face, my hands are too slippery to open the tin. I finally realized that I could scoop some Rosebud Salve into a more easily opened container. I buy this at ebay, but I've also seen it at Victorian Trading Company. I'm currently using a minted version. I misplaced my Rosebud Salve in my suitcase last time I was in Oregon. Two days without it in the cool March air left my lips dry and rough. Thankfully, I discovered the salve in an unexplored pocket, and my lips recovered overnight. I wore green nail polish today (which isn't all that unusual for me), we listened to a lot of Irish music (again, not unusual) and we had a fabulous Irish meal. We splurged and bought Irish rashers (that's what the Irish call bacon) for our Colcannon. We also had black pudding and brown bread and Silver Shred marmalade. The children all love black pudding, but the younger two ate the rashers and left much of their colcannon behind. They'll like it better tomorrow when it appears as Bubble and Squeak. has flour in it, and line the bottom with parchment paper. Place flour in bowl and sift in Soda, Salt and Sugar. Mix to combine. flour. Mix thoroughly with stand mixer,adding the rest of the buttermilk. Pour mixture into lined pan. Sprinkle with sesame seeds. baking dish to remove bread. Pull the waxed paper off the bread. and cheese (brie is nice). Especially nice with a cup of tea. 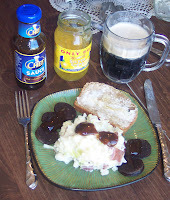 Although I love corned beef and cabbage, our hostess in Ireland last year told us that Irish people in Ireland don't eat "that stuff", that it's more typical of Irish immigrants in the United States. So we'll have corned beef and cabbage some other day. I am taking some free online courses so that I can change my teaching certification from inactive to active (may be teaching summer school). OH MY WORD. These courses seem to be designed for someone who has the IQ of a turnip, but by someone who wants to use a lot of fancy words as he/she educates the turnip. Today, I learned all about semantic feature analysis graphic organizers. Do you know what semantic feature analysis organizers are? They are charts. And, as I was told about 3,241 times during the audio-visual lesson, semantic feature analysis graphic organizers can help students to learn and retain information. Imagine that!!!!! Charts can help students to learn and remember!!! AND....GET THIS..... YOU CAN PUT SEMANTIC FEATURE ANALYSIS GRAPHIC ORGANIZERS ON PAPER OR A WHITE BOARD OR AN OVERHEAD PROJECTOR OR...well you get the idea.In the audio-visual portion of the lesson, words come up on the screen, but there is also a voice-over who reads the words. You can't click onto the next screen until the voice is finished reading the present screen. I can read the screen with its totally obvious information in about 3 milliseconds, but must wait for the minute or so as the reader slowly and deliberately reads the information to me. Today, I read a book as I worked my way through the lesson. ARGHH!! !I keep telling myself that it's free and it will get my certification active again so that I can teach in a public school if need be. Okay....frustration over. You may go back to your lives and ignore the woman with the frothing mouth and glassy eyes cowering in the corner with her semantic feature analysis graphic organizer. For weeks now, I have been blogging away but not sharing my blog address with many real-life friends. I finally and bravely shared the address with a friend yesterday...and woke up this morning realizing that I had blogged about my hometown (in a not always complimentary manner) ... and my friend still lives in that area. Oops. I wish I could eloquently express my varied perspectives on my past and present locations, and how their voices argue with each other in my mind. For example, the cozy small-town perspective of my past finds my current master planned community of carefully matched homes rather boring and the homeowner's associations are just annoying. My present Bigdesertcity perspective finds the small town neighborhoods a little mis-matched. One thing I miss about the small towns is the way they value their history. Here, we implode old buildings and promptly replace them with something new. These thoughts have led me to the conclusion that my blog captures only snapshots of my life and my thoughts. It cannot show you the entire moving picture, only what I was thinking at one moment in time. My blog captured my feelings while driving through my hometown and my viewpoint from the "hospital hill" -- but it would be difficult to express how much I miss those dark green hills ... or how much I would miss the balmy days of March if we moved from Bigdesertcity. "Home" means so many different things to me. When we fly to Oregon to see my husband's family, I say we're flying home. When I drove to Smalltown, I said I was visiting my "hometown." But when I walked in the door of our stucco house with the obligatory palm tree in the yard, that was home too -- and more home-y than anywhere on earth because my husband and my children are here. Eleven years ago I moved away from my birthplace -- a small coastal town in Washington state. After five years in Oregon, I moved to a very new master-planned community in the desert. Last week I visited my hometown. It looked much the same, probably, but to my eyes it now looks a bit shabby. The fence is gone from my old front yard, but our old house is still the dusty blue my dad painted it soon after I left home. Plants in black plastic pots cluster around the front door, and the once-tidy rose bed seems to be covered over with grass. A search for an old friend led me up the tallest hill in town, to the hospital where I was born. The hospital lobby was filled with fussy children and the aroma of fresh espresso. The desk attendant said my friend was not on their patient list, so I returned to the parking lot. I wandered to the edge of the hill and looked down at the rows of tiny houses. From this distance, the town sparkled in the spring sunshine, surrounded by dark evergreen hills and a silver harbor. Far off on the western horizon the silver harbor met a gray line that I knew was the Pacific ocean. All thoughts of shabby depressed little towns fled as I meditated on the beauty of my native environment. This week I am thankful to be back with my family in the desert. As I prepared breakfast this morning, I played a Tommy Fleming CD. The first song on the CD is "From a Distance." I've never liked the song, but I do like Tommy Fleming. As I listened and scrambled our eggs, I thought that it was sad to hear the Lord portrayed as so very distant from us, but as I kept listening I suddenly heard another viewpoint: it's not about the distance, it's about His perspective. Our lives are like my favorite Impressionist paintings -- just a bunch of dots and blobs when seen too closely, but take a step back and the painting makes sense and becomes a thing of beauty. and I'm not always able to attend when it does. believing that Your death purchased my pardon. sharing a meal with Your friends. I know You share this afternoon with me. when criticism leaves me wounded. You carry me when I am too weak to stand. my friend told me I was grieving. but it is an accurate word. and driven me to You. Use this one too, Lord! ...Be courageous and let your heart be strong. can be closer than that. I'd like more money, Lord. 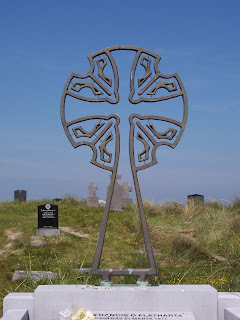 I'd like to fly away to Ireland today. will be with me every day. open my eyes to appreciate Your masterpieces! Show me Yourself, at work and involved in Your creation. and a revival in my soul. ...Cleanse me from my hidden faults. Lord my rock and my Redeemer. my faults are far from hidden. my lack of faith in Your ability to empower me. while You lead her on a different path. while I am uncertain and worried. and I praise You that Your strong arms will carry me through this one. ...He rescued me because He delighted in me. and though I don't feel "rescued"
Clothe me with strength, Lord. I'd like to comment on the current Homeschooling battle in a California court, but I'm too tired. We're making some changes in our home decor. Our new theme for the guest bathroom is coffee and tea, and I ordered this poster. It reminds me of the theme song from the Mrs. Bradley Mysteries (a delightful mystery series on DVD; Diana Rigg plays Mrs. Bradley). I already have a knickknack shelf with ten china cream pitchers in that room, so we're off to a good start. We've had red and pink roses dictating the color scheme in this room for awhile, and it's time for a change. A month or two ago, my husband and I looked around our home and said, "Our decor no longer reflects US." Much of our decor was purchased or gifted to us ten years ago, and our personalities have changed and expanded since then. We'd like our house to be a little less foofy. I describe our style as "Grandmother's Cottage." The grandmother of my imagination grew up in the Victorian era and loved the dignity and beauty of Victorian style, but travelled around the world later in her life (perhaps in the 30s) and her home is a blending of Victorian china, vintage travel posters, and photos of Irish landscapes as well as old European churches. Perhaps Grandmother is a bit like Aunt Ada Doom (in Cold Comfort Farm) after Flora awakens her spirit of adventure. and I have a question about some blogs I've read lately (not Arby's blog in the above link). Why do some bloggers put music on their blogs? I tend to read blogs while watching tv (and the music doesn't blend well with Bones or American Idol or my favorite Britcoms) or while the kids are napping (and obviously I want it quiet during that time -- but I forget to turn off the sound til coming across one of these blogs). So why the music on the blogs? 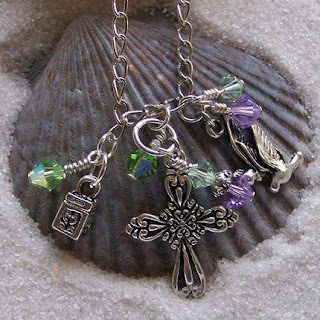 I bought this lovely necklace from http://www.mompotter.blogspot.com/ (there's a link on the right hand side to her etsy store. As we flew over BigDesertCity, a couple behind me were obviously visiting for the first time. The man seemed to have done a bit of research and was pointing out the sights to the wife. They were amazed at "all those houses in straight rows." They observed the many swimming pools and gasped at the lack of trees. And then the man stated very seriously, "Water is very precious to these people." As one of "these people" I suddenly felt like a member of an obscure desert tribe being documented by National Geographic. Especially when he followed this with another serious statement in a thoughtful amazed voice: "Imagine...imagine...people actually want to live here." Thankfully my seatbelt kept me from rolling in the aisle with laughter. 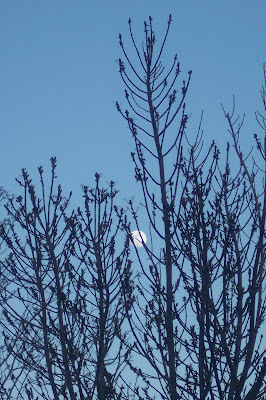 I have updated my blog now, and the posts about my trip begin with last Friday, February 29. I'm at the Portland Airport, waiting to board my plane back to the desert in just a few moments. It's been almost a week since I saw my husband and my kids. I miss them -- and I miss my husband's cooking! It's been emotionally exhausting and I am so happy to be on this final leg of the journey. The Lord has continuously reminded me that my identity as His child and His beloved has not changed -- even as my role with my father changes, and as I have been missing my beloved husband so very much! I want to give a big compliment to Enterprise Rent a Car. The friendliness of their staff is admirable. And when I pulled up to their return center today, a staff member opened my car door, called me by name, and handed me a receipt. Nothing to sign, no fumbling for my own papers about the rental, just thanks for my business, and simple directions to the terminal. Tomorrow I get to go home!!!!! I am more than ready. I miss my husband so very much...and of course my kids too. Today I had financial errands to run, and I took my dad to lunch. After looking for a restaurant he recommended...which he told me was in a different town than its actual location...we finally found it. We walked through the doors and I suddenly realized I'd been there before. When I was pregnant with Faith, my husband and I had met some of his coworkers there. It is a smoky place filled with the odors of years of fried food. I would advise pregnant women to stay far far away from this restaurant! My dad and I both ordered salads...which took half an hour to arrive...and mine was a really crummy salad! I met my aunt for a snack a little later and I had a better salad with her. I did not sleep well last night. The stress of taking over my dad's financial affairs, interacting with this man who no longer seems very much like my dad, being away from my husband, and driving for eight hours yesterday has left me weak and mush-brained. What a long day! I drove to Smalltown on the Washington coast, and its neighboring town of Hickville. Neither of these towns has been economically prosperous for years, and it looks as if nothing has changed. I had to visit some credit unions to withdraw money for my dad's care, and I visited his new assisted living center. They'll have a room for him in a couple weeks. Although it's in Hickville, it is a pleasant place with a caring environment, and I think he will be very happy here. I know he will find that he knows many of the residents. I did find a decent cup of chowder at a riverside Seafood market. Not the most fabulous chowder I've ever eaten (that was in Ireland...) but better than we find in our desert metropolis. I was able to put aside the stress...part of the time...and just enjoy the green hillsides and the trees and the clouds. My dad sent me on a bit of a wild goose chase; he really wanted me to visit my mom's friend who is in a nursing home. He called me this morning to tell me that this friend was not doing well and not expected to live. He didn't want me to be shocked by her frail appearance. I thought this was extremely thoughtful of him to tell me this...but he left out one important detail. I went to the nursing home. They said she was no longer there but she might be at the hospital. I drove to the hospital, and hesitated for a moment outside as I realized that not only was this my birthplace but also the place my mom died. In fact I had not visited that particular hospital since the last time I saw my mom. I asked the front desk attendant and they did not have my mom's friend on their patient list. This was not a wasted trip though, because from the hospital parking lot (built on a hill), there's a beautiful panoramic view of Smalltown and Hickville and the hills and the Harbor surrounding them. The clouds were particularly lovely this afternoon, and it was a great reminder that though my hometown looks a bit ragged, it was a beautiful place to grow up. Tonight I called my dad when I reached Salem, and he said, "Oh, your mom's friend isn't in Smalltown anymore, she's in Olympia." That's an hour away from Smalltown and I was nowhere near there today! I had tea with a friend who lives near Hickville: a refreshing break. So....a very long exhausting day full of driving and memories and beautiful scenery. A friend and I did a lot of sorting at my dad's house today. A bit of Royal Albert china, a lot of junk. A debt total that is unbelievable. and I'm not used to driving more than 25 minutes from home. So many details, so many burdens. and the surrounding presence of God. This afternoon I got a rental car and drove to Salem. My dad is currently in an assisted living center not far away. I'm staying with my husband's aunt and her family. Their home is always a pleasant and refreshing place. I saw my dad for a little while this evening; it was the first time I'd seen him since last July. Our plan is to move him to an assisted living center in his home town. Well, a little town next to his home town to be specific. He would rather go back to his house near Salem, but that is not possible anymore. An assisted living center near all his friends back home is the only thing that convinced him to stay in an assisted living situation. A soft rain is falling outside and I am delighting in the many shades of gray sky and green hills. I hope to find a cup of clam chowder at some point during this trip -- a decent chowder is difficult to find at home in the desert. My friend spoke at the session this morning, sharing some of her own spiritual journey, as well as insights on the life of the Mary. Of course she did a lovely job, and it was so special to be present for this. In the afternoon we went to Saturday Market. I purchased several small decor items. Tonight my back was really hurting so I skipped the evening session and came back to our room to lie down...and have a long phone conversation with my husband about the fabulous Morroccan food!